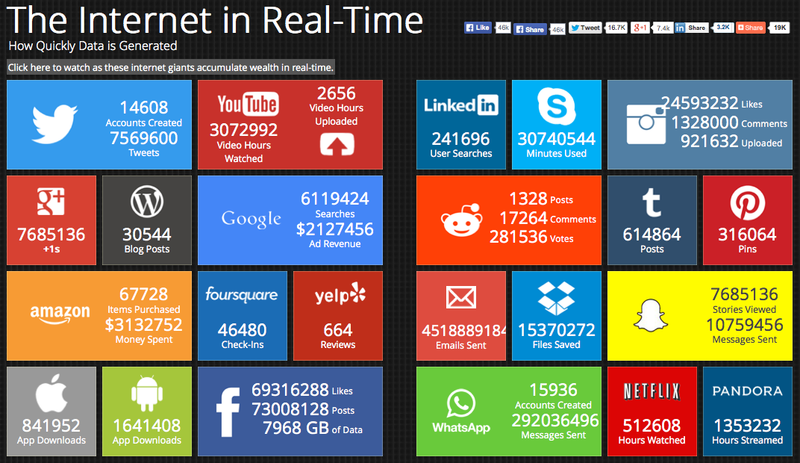 We've written about data visualizations in real time in the past, including the Internet In Real Time and Breathing Earth. Our students are always amazed to watch the speed at which the data changes, and they're even more curious about how it is compiled. 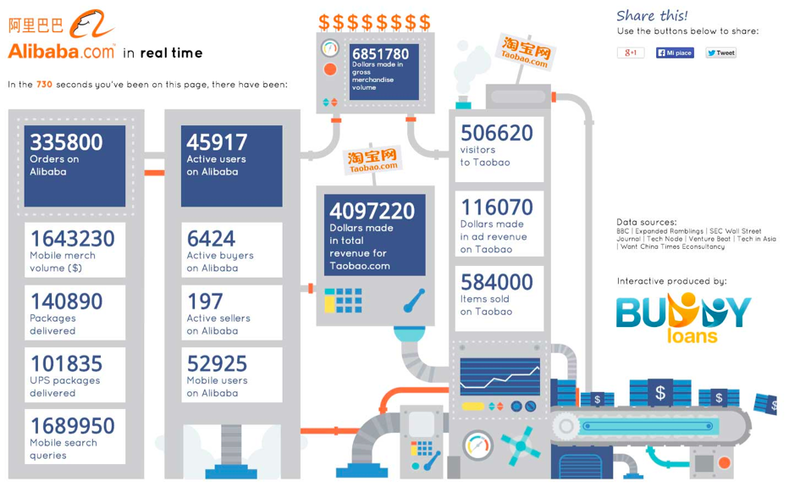 While the numbers are staggering for the sheer volume of data for social media and the Internet, they pale in comparison to those for the Chinese company Alibaba in real time. Since we play The Stock Market Game in our classes, our students were well aware of Alibaba and its initial public offering (IPO) this fall. They know that it was the largest IPO in history and that it trades on the New York Stock Exchange. Now they know why. We had the students open two screens to compare Amazon data on the Internet In Real Time with Alibaba to see just how big this global wholesale trade giant is. At the end of one class period, Amazon orders were 160,000 compared to Alibaba’s 1.7 million. That got their attention and drove them to make more comparisons with other information between the two sites. It also led to discussions about the role social media plays in financial success. Real time data visualizations provide kids with real world connections to what they know and recognize. They pique their curiosity; that's their power. As with other visual content, there are a host of possibilities for using them in the classroom to demonstrate the strength numbers have on perception and success. Aside from the fascination in watching the aggregation of data, it also is a pointed reminder that this could be done for an individual as well. 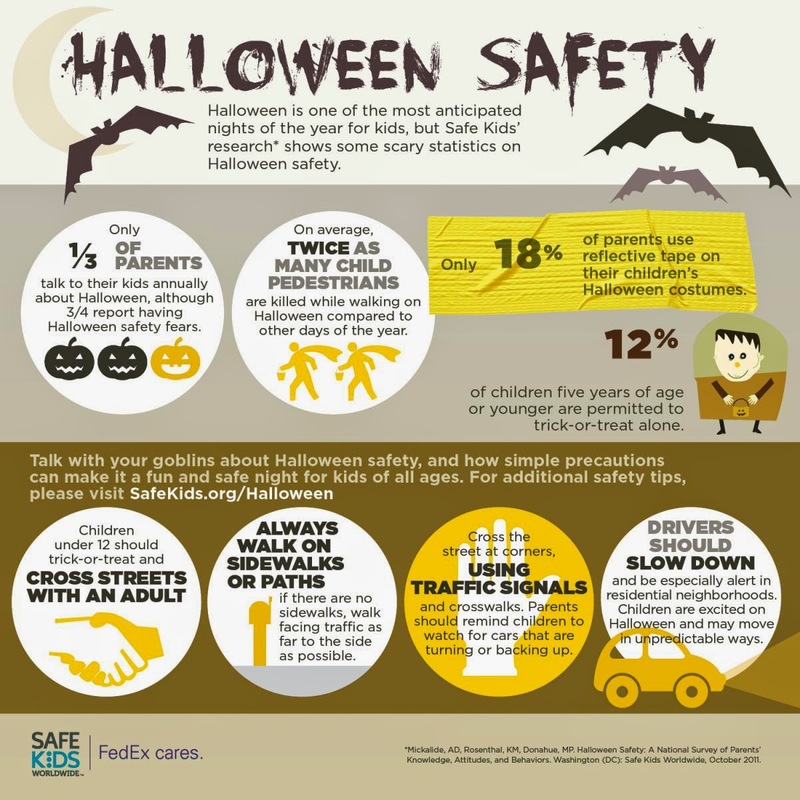 With the plethora of Halloween infographics about costumes, candy, and traditions, perhaps the most important one for this year is the Halloween Safety infographic from Safe Kids. This much anticipated holiday deserves our attention, and we should make time to talk about safety with our students. 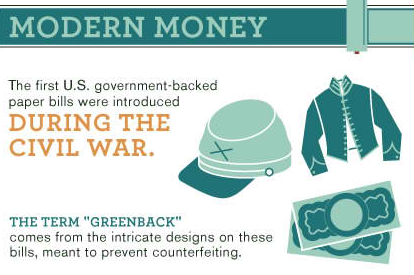 This infographic is a perfect place to start. It provides some quick tips that can be used as discussion starters. It's a worthy one to share with parents, too, especially since some of the statistics are scary. In order for our learners to see how designing information changes how it is viewed, the students this year placed their visual infographics side-by-side with their linear notes to see the transformation. It was the “ah ha” moment, when they could examine how the delivery of content mattered and how the deliberate choices in font hierarchy, color selection, and placement changed the way others perceived the ideas. Reflecting on their own work, the students saw firsthand how media could change and enhance a message. Paralleling the visual and linear content enabled them to observe the full effect of how design could give content power. It provided context for the information. For more than four years, we’ve been working with our students to think about the design of information and how presentation changes its perception. This newest crop of acronym infographics exceeded our expectations, in part because we worked closely to develop a stronger understanding of both the elements and principles of design. As with any other skill, students need guidance in this area. Design literacy requires the same instruction as media and financial literacies. 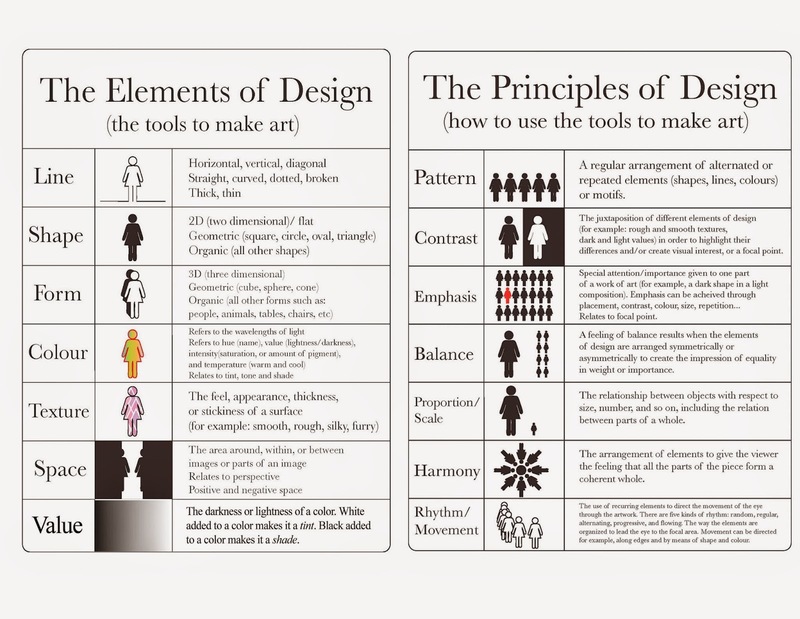 To help them better understand "the tools to make art" as compared to "how to use the tools to make art," we supplied them with the charts below to clearly separate the elements and principles of design. The students were given other resources and guidelines to help train their eyes to think like designers. They looked at infographics created by professionals and deconstructed what they saw. 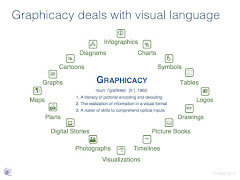 The process of learning to look at visual information is a core skill of graphicacy. 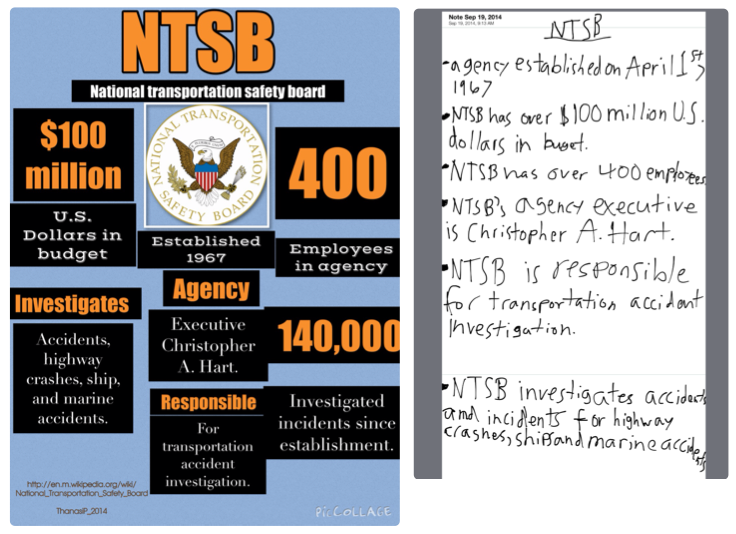 The ability to decode information helps students transfer these visual thinking concepts into creating their own work. 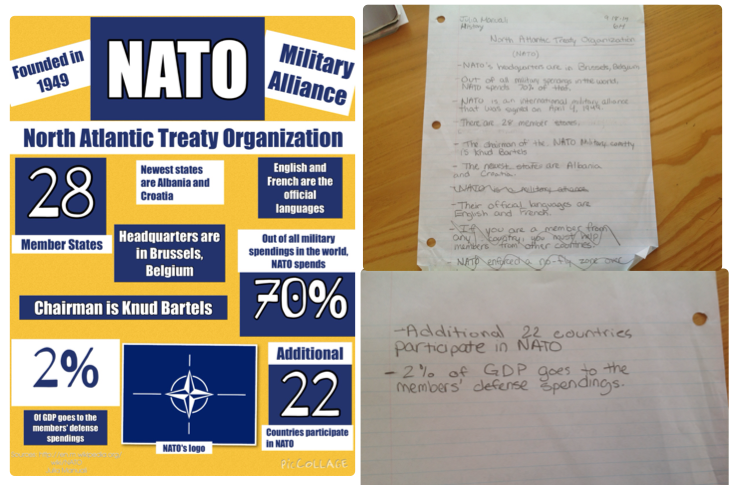 Of course, before the students started, they researched and gathered the information from various websites as notes. This included citations for the resources. We stressed that quality infographics source the information at the bottom. Our students know we stand by our mantra, “Content First, Pretty Second.” Without strong content and the evidence to support it, the message is questionable. Seeing the shift from linear to visual helped the students teach others about their topic. It’s the same art of persuasion we refer to in media literacy. The best way for learners to understand how to manipulate information is to do it. Attraction and appeal matter, and perhaps it’s a lesson for us as educators as well. Designing information provides context for content; the more visual it is, the stronger the retention. Many current initiatives, such as blended learning, genius hour, and flipped instruction, are all embracing the same potential of disrupted education. 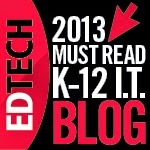 They all recognize the multi-latticed, pan-directional nature of contemporary learning. In essence, they are trying to make class time less like class time. We call this the "unclass." Learning no longer begins and ends at the school bell. Students don’t switch off their devices and their senses of wonder just because the final period clocks out. Even though children have always pursued hobbies and outside interests, today they can network their school inquiries with their personal passions and continue their threads of discovery any time, any where. Learning becomes more like free time and free time more like learning. Just like adults who juggle smartphones and information streams, kids today reach for a variety of sources to satisfy their natural curiosities. Schools that try to stifle this octopus impulse can run the risk of becoming irrelevant to contemporary learners. Recently, we have initiated the “unclass” philosophy to change our prevailing stencil of in-school activity. Rather than falling back on the typical model of teacher instruction and student compliance, the unclass approach imagines a classroom as neighborhoods of self-directed learning. It encourages imagination and skills through social media, backchannels, and self-publishing. Just as companies embrace flexible workspaces and educators flock to “unconferences,” teachers, too, can cultivate student dialogue and self-direction that can be continued at home at the end of the day. 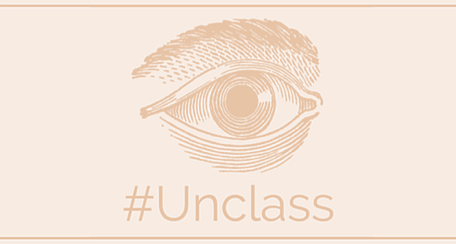 The unclass approach is both a structure and a practice. It offers a strategy for running an organic environment in which children have ownership over their own time. It also still achieves the desired goals of learning and skill acquisition – such as linking the controversies of the Reconstruction Era to America’s racial climate today, or making the scientific method actionable in a digital, non-tinkering world. The unclass philosophy also emphasizes a mindset. 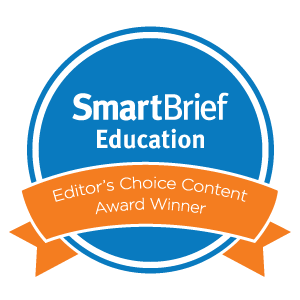 This outlook recognizes that students and teachers can engage in meaningful collaboration well after a 40-minute period has ended. In fact, only a few key questions can be addressed during a day's limited course time. The ramifications of these inquiries, though, can echo later into living rooms, ballparks, and backseats via social media and digital devices. Creative apps and self-directed technology mean that learning occurs via an unclass, with enlightenment an exuberant affirmation of student passion and teacher inspiration. 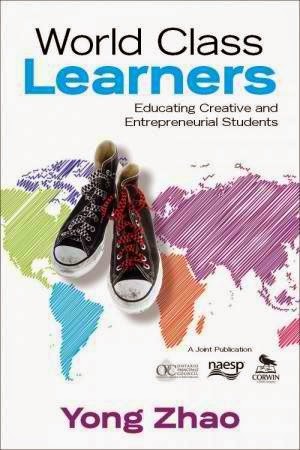 In his terrific book, World Class Learners: Educating Creative and Entrepreneurial Students (Corwin, 2012), Yong Zhao talks about the "grammar of schooling," which refers to the organization of class time and rosters into periods, sections, grades, and subjects (180). He points out the "inherent logical contradiction" in trying to instill student innovation and initiative within this type of structured, one-size-fits-all curriculum (94). In fact, Zhao quotes Professor Kyung Hee Kim in the observation that while "teachers claim to value creativity in children," they often squelch "creative behaviors," because they are non-conformist and hard to wrangle (14). Zhao argues that transferring the responsibility to the learner emphasizes engagement, accountability, and relevance for all students (171). Extrapolating from Zhao's thought-provoking work, teachers in an unclass find that their "primary responsibilities have shifted from instilling the prescribed content in students following well-established procedures in a structured fashion to developing an educational environment that affords children the opportunity to live a meaningful and engaging educational life" (176). 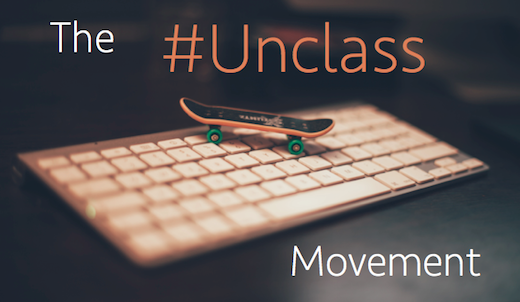 For more ideas about the unclass movement, we recommend "The EdCamp Mindset - How An 'Unconference' Can Yield An 'Unclass.'" Financial literacy is about much more than balancing one's (online) checkbook. Financial literacy represents a cross-curricular mindset, a sophisticated understanding of how money, media, and messaging unite in the public sphere. Courses in economics or life planning typically target high school students in order to instill values of earning and saving. These are noble and much-needed goals. Authentic financial instruction, however, should begin much earlier, as children first become aware of sales taxes on their lollipops and marquee ads during the Superbowl. True financial literacy embodies the cross-section between business and consumerism, entrepreneurship and federalism, investing and gambling. 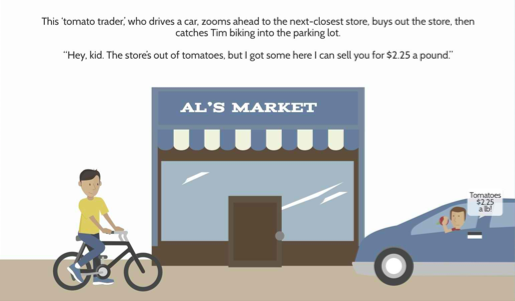 The videos and infographics below provide excellent ways to introduce financial literacy at the elementary and middle school levels. 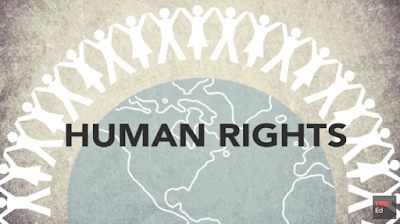 These topics can be woven into any course of study, from mathematics to social studies. They are great ways to kick off a morning's discussion or to enrich students who always seem to finish their work early. The TED-Ed video, "What Gives A Dollar Bill Its Value?," from educator Doug Levinson and animator Qa'ed Mai, offers a superb overview of how America's currency functions. Specifically, it traces the value of paper tender in its transition from gold-based notes to faith-based cash. 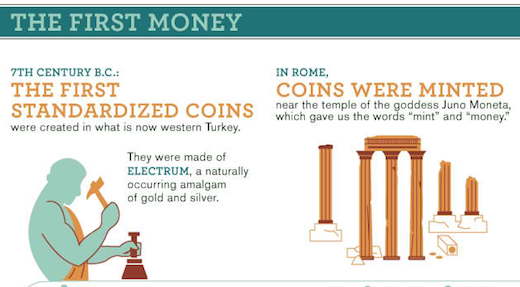 This TED-Ed animated cartoon is a prime companion to the History Channel's infographic about "The Story Of Money." Produced in partnership with Column Five, this detailed visual narrative parades a fascinating series of monetary facts, from the legend of the first penny to the largest bill in human record. As young students plan their futures, they can appreciate the sobering facts about saving for college via the NBC News video, "How Bad Is The Student Debt Crisis?" Part of its winning Show Me series, NBC explains the crushing costs of tuitions, fees, and textbooks as impediments to twenty-something progress. Finally, as many teens play variations on the Stock Market Game in their math and social studies classes, the real truth about modern equity emerges in the infographic, "How High Frequency Trading Works." Also designed by NBC News, this illustration illuminates how hyper-speed data processors rig high-volume trading to favor computational efficiency. The casual investor is no longer a factor in moving the market.